Tonto appeared to be endorsing suicide while itemising the importance of praising God. 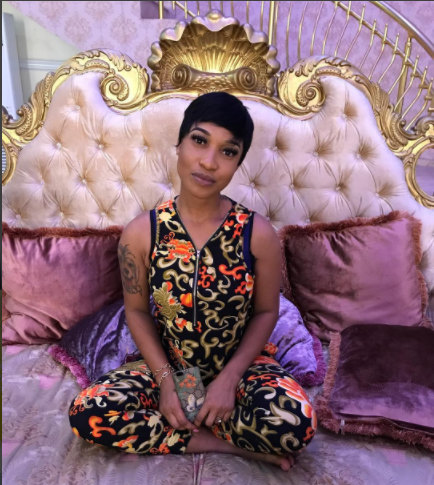 Tonto Dikeh's suicidal days may be behind her, but it appears the mother of one has no qualms with anyone who decides to tow that line - specifically, her enemies. This much can be deduced from a post she shared on her Instgram page on Friday where she declared that "praise makes your enemies commit suicide faster cos they expect you to be in tears yet you are joyful". Tonto, who has been in the news these last few months over her rocky marriage to Olakunle Churchill, has been in a war of words with her now ex-husband since news of their troubled marriage got out. Could Tonto be referring to Churchill in this post? Either way Tonto, suicide is never an option and you should know better.